These modules are formed of a stack of membranes and support plates. Any type of membrane (flat) can be used in applications ranging from MF to high pressure RO, these modules normally being used on loaded liquids (industrial processes, IWW, MBR ). Their design is based on that of filter presses. The fluid to be processed circulates between the membranes of two adjacent plates. At the same time, the plates support the membrane mechanically and allow permeates to drain off. Their layout is compatible with parallel and/or series circulation schemes. This makes it possible to set up individual assemblies having up to 120 m² surface areas. The permeate that collects in the grooves of the plates is discharged under pressure ( RO, NF ) or in a vacuum ( UF, MF ). The liquid sheet between the plates is between 0.5 and 3 mm thick. 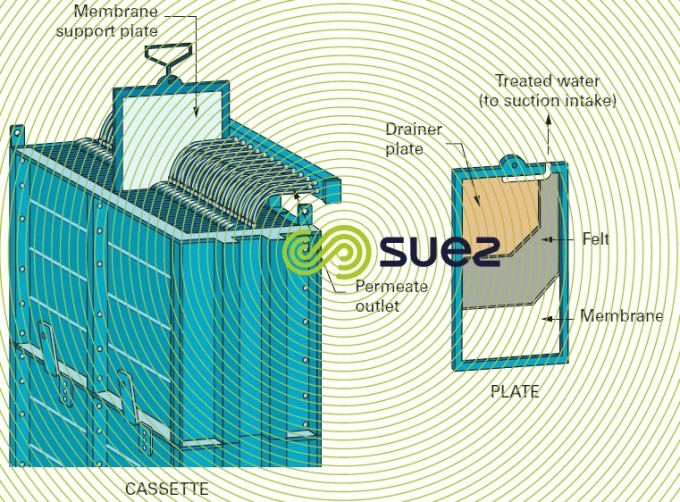 Figure 5 illustrates the cassette and plate supplied by one of the manufacturers of flat UF modules. Aeration is included in the base of clarification membranes. Of average compactness, these modules have the advantage of being easy to dismantle thus allowing them, if required, to be thoroughly washed by hand. The membranes can be replaced just as easily if necessary. In view of the length and winding configuration of the circulation channel, head losses are high and the low surface area of the plates means that more of these, and of their couplings, are required, thus reducing the system’s reliability.